Christian: My work on copy number variation of chromosome 15q13.3 started with a patient I saw as a genetics resident on the genetics consultation service at Texas Children’s Hospital. As a physician-scientist, all my work has been inspired by patients, and my ultimate goal is to provide a deeper understanding of the mechanisms of disease, which then can be translated into new therapeutic avenues for the respective disorders. Christian: There are two aspects that are most exciting to me. First, we have been able to generate a human model of disease, and we can measure functional consequences of a genomic change in the patient-derived cell lines. This may become particularly relevant as we begin thinking about pharmacologic intervention, as it allows us to test new drugs and compounds on these patient-derived neuronal cell lines prior to subjecting actual human patients to those drugs in clinical trials. Second, one of the most fascinating findings of our study is the fact that increased genomic copy number of the CHRNA7 gene does not necessarily lead to increased functionality of the respective protein. This may have important implications on how we think about this duplication, and how we would consider approaching it therapeutically. Christian: We have always been puzzled that for several genomic loci, both deletions and duplications of the same locus predispose to neurodevelopmental disorders that look somewhat similar. One would expect that opposing genomic events cause clinical phenotypes that are also in different direction. For 15q13.3, we now provide first pieces of evidence why opposing genomic events may lead to functional changes that are actually in the same direction. This could be the case for several other genomic disorders, and is kind of a paradigm-shifting concept. Christian: For all trainees in the medical field: treat every patient with the care and curiosity as if you could learn something entirely new. All of my research projects started with individual patients. They continue to be the inspiration for everything that I do. For all trainees and young scientists (MD and PhD): have a hypothesis for every experiment, but be completely open to the outcome. Do not “expect” a certain result. Some of your most important discoveries will originate in the unexpected. Christian: I have four children: 6 years, 5 years, 2 years, and 6 months old. Life is crazy at home. Coming to the laboratory feels like vacation to me. 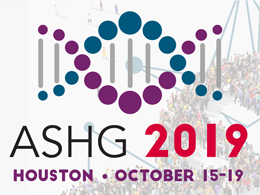 Christian Schaaf, MD, PhD, is an Assistant Professor at Baylor College of Medicine and has been an ASHG member since 2009.